With new features being added all the time, Google AdWords is becoming more and more powerful and complex. But luckily, the tools and features for efficiently managing AdWords are multiplying too. Here’s our breakdown of the top 10 Google AdWords management tricks to save you time, and improve your ROAS in the process. AdWords Campaign Experiments and Ad Variations will automate and help you keep track of the A/B tests you should be running, so you no longer have to manually monitor them, activate and deactivate them, or even compare performance to decide the winner. 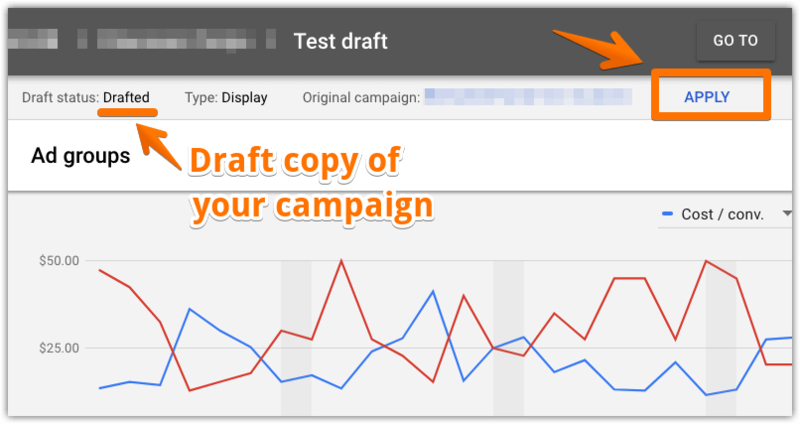 Campaign Experiments let you test different bids, different ad copy, and even different structures within your campaigns -- and have Google automatically select the winning variant at the end of the test period to become the new default. These features allow you to spend less time managing your tests, and reduce the chance of forgetting to resolve tests you're running. They not only save you time, they help you avoid mistakes. And since they makes testing easier, that means you're more likely to run more performance-enhancing tests. Let's look at Campaign Experiments first. To set up a Campaign Experiment, first click the "Drafts & experiments" option at the bottom of the lefthand page menu (using the new AdWords interface). To run a Campaign Experiment, you'll need to add a Campaign Draft first -- and then you'll be able to run the draft as an experiment after creating it. Hit the blue "+" button and you'll be asked to name your draft and select a campaign to base it on. Save it and you'll be taken to your draft campaign. This is an exact COPY of the existing campaign you chose, but any changes you make to it will affect this draft copy only, which means they won't really do anything at all until you apply them. So make the changes you like -- to your bid strategy, your keywords, your ads, or anything else you want -- and click "Apply" at the top. Then choose the option to run an experiment, and hit Apply. It will ask for your experiment name (use something descriptive like "[Campaign name] - CPA bidding experiment"), start date, end date and what percentage of traffic you'd like to send to the experimental campaign. Fill those out, continue and your experiment is now live! You can view your experiments any time. They're listed with your regular campaigns, only with a flask icon, and you can also find them in the Drafts & experiments menu you were just in. Now let's look at how to run Ad Variations. Just like before, the first step is going to "Drafts & experiments" at the bottom of the lefthand page menu. Only this time, click the Ad Variations tab. Then choose which campaigns you want the ad changes to apply to, as well as the ad type. You can also filter to only ads with certain characteristics if you want (like ones with the word "Free" in the second headline). Continue to the next step and you'll specify the type of variation you want. You can do a simple find and replace, update text, or swap headlines. In the third step, you'll have the option to set the other parameters of your test (name, start and end dates & the percentage of traffic to expose the new ad variation to). Then save it and you're in business! Later, you can check the status and performance of your ad variations in the same place, "Drafts & experiments." If you like the results, you can have Google permanently apply the changes to your campaigns. While hands-on managers have historically favored manual bidding, Google’s automated bidding options have gotten much better over the past couple of years thanks to machine learning. You have a lot of different automated bidding options to choose from now: from those that just supplement your judgment by adding automation on top (like Enhanced CPC and Target CPA) to those that remove the need for you to provide any guidance at all (like Maximize Conversions or Maximize Clicks). Often, these automated options will not only save you time; they'll also improve your results. Here's how to implement them. In the Settings menu of any AdWords campaign, go to Bidding and you can set a bidding strategy of your choice. Mouse over any option to get a description of exactly what it does. And note that your options may differ depending on the campaign type, the conversion tracking you have set up, and the number of conversions the campaign has gotten recently. Tip: To use the conversion-focused automated bidding options for a campaign, it needs to have at least 15 tracked conversions over the past 30 days. An automated bidding strategy can easily save you hours of work each week by eliminating the need to manually tune bids at the keyword level. It also takes other factors into account, like time of day and the user's geographic location, to maximize your ad performance without your input. Just be sure to choose an option that matches your advertising goals. If you're making ecommerce sales and shooting for ROAS, choose "Target ROAS". While if what you really want is traffic, "Maximize clicks" is the right choice. You can read about all the different automated bidding options in more detail here. A word of caution: don’t use automated bidding settings as a "set it and forget it" way to put your account on full auto-pilot. You'll still need to continue carefully monitoring your account’s performance, especially in the first week or two after switching to automated bidding. And even after that, hiccups in your campaign's performance can sometimes lead to unexpected consequences in the automated bidding management. 3. Take Advantage of Adwords Editor. The grandfather of all AdWords management tricks. Unless your account is very small, you can save time by using AdWords Editor for any wide-scale changes. Google's free desktop application might be ugly, but it's a much smarter way to get large amounts of things done than the regular web interface. Between faster find/replace functionality, backup exports, automatic error checking and the ability to copy campaigns between accounts, AdWords Editor makes it easy to make sweeping changes at scale, and it'll also keep you out of trouble if you try to make conflicting changes. It can also be great for air travel, as it allows you to download your account, work on it offline, and upload the changes the next time you have an internet connection. With the addition of just these two features, Google vastly improved its AdWords web interface a few years ago. Now can get away with using AdWords Editor a lot less often than you used to have to (though it's still the better tool for bigger changes). Just select the items you want to change, click Edit and make the change you want. Different from automated bidding (where you give Google partial or full control over your bids), you can set up automated rules to take specific actions when you want based on triggers of your choice. You can set up rules to trigger once at a specific day and time (for example, to pause some ads and enable others if a promotion is ending over the weekend). Or you set them to run once each week, or once every day (for more routine adjustments or reporting). I like to use them to monitor for performance exceptions. For example, I have one rule set up to alert me when a client's weekly ROAS is lower than their targeted 800%, and another set up if their daily total conversion value drops below a certain threshold. Tip: always use the "preview" function before saving a new rule. Some of our favorite uses for scripts are to automatically check for broken links, automatically test and report on the performance of different bids, and to automatically refresh prices to be displayed in ads. You can even set up automatic bid adjustments based on the weather. If you're brave enough to try them, Search Engine Land put together a good primer series on AdWords scripts, starting with how to read them. Tip: always execute a new script in preview mode first. 7. Focus on the Metrics That Matter. This may not seem like a time-saving tactic, but it's a very powerful one in disguise. A lot of AdWords managers spend far too much time focusing on "upstream" metrics like CTR, CPC, clicks, impressions and quality score. But those are all secondary to the key performance indicators of the business. Above all else, focus on the downstream goals that matter most for your business. That focus will help you save time while making your advertising more effective. Upstream metrics like CTR and CPC are useful only insofar as they help you achieve your actual business goals. 8. Use Excel to Draft New Ads and Make Bulk Edits. When you're breaking out new ad groups, building out an account, or trying to test a large number of new ads, writing ads in the web interface is pretty inefficient. Of course, there's a better way. You can draft new ads or edits in a spreadsheet and then upload it via AdWords Editor, or via the web interface. To make edits (to ad copy, bids or otherwise), first download the spreadsheet, then edit it, then re-upload it (be sure to save the original as a backup). To add new text ads or keywords, add a new row with the pertinent info. 9. Shared Negative Keywords, Budgets & Placement Exclusions. Instead of setting the same negative keywords for each individual Search campaign, you can just create one (or more) negative keyword list and apply it to as many campaigns as you want. For Display campaigns, the same is true for placement exclusions, which work much the same way. And shared budgets allow you to set a single spend amount to spread out among all your campaigns (or just a few of them). So you don't have to rely on your Magic 8 Ball so much anymore. These simplifying features can save you a significant amount of time. 10. See Google Analytics Data Within AdWords. One last tip. This one's pretty basic, but I'm still amazed by how many clients don't have it set up. Assuming you use Google Analytics, you should definitely have it connected to AdWords. Especially if you have conversion tracking (or ecommerce conversion tracking) set up in Google Analytics. This way you can import the data into AdWords so that you can see conversion figures or revenue AND engagement metrics like bounce rate directly in AdWords. This will save you a lot of time because you won't have to look at Analytics itself nearly as often. To make that happen, you just need to have at least "Edit" level permissions to the Analytics profile and "Administrative" (or Manager) access to the AdWords account. A) Follow the instructions here to link your Analytics and AdWords accounts together. This will allow you to see AdWords data such as cost, CPC and CTR in your Analytics account. B) Then follow these instructions to begin importing in the other direction as well: bringing your Analytics data into AdWords. C) Finally, follow these steps for importing conversions (goals and/or transactions) from Analytics into AdWords. Voila! You can now see Analytics data in AdWords -- and AdWords data in Analytics. Go implement some of these tricks, and start basking in the glory of a lower-maintenance AdWords account.